Hi, I’m Danny Ford. I am a UKCP Registered Psychotherapist and IMTA Accredited Mindfulness Teacher. You can work with me Online or in person in Wakefield and Leeds, West Yorkshire. Similar to the counselling clients and meditation students I now work with, I was once someone who felt lost and empty inside. I believed I was ‘different’ from others and that no one else suffered like I did. There came a point in my life where I felt that my life had to change, or I would die inside. I then moved away from my family and travelled and lived in China, Ireland, and Australia for 6 years in an attempt to make peace with myself and find my place in the world. It was through discovering mindfulness and a meditation community in 2008 that I finally felt that I had “come home”. The Dharma teachings I listened to as well as the meditation practice, were life changing. I finally felt nourished, accepted and loved by others. Since my discovery of the goodness of the teachings of the Buddha and the practice of mindfulness meditation, I have dedicated the past 6 years of my life to healing myself and studying to become a meditation teacher and psychotherapist. My wish is that no one feels unlovable or suffers from chronic loneliness. My work as a psychotherapist and mindfulness teacher is a way of taking steps to help make this happen for my clients. My key goal for my therapy clients and meditation students is to help them find more love and connection within themselves and with others. I want you to nourish yourself so that you truly value and accept yourself. When you feel worthy and confident, you will have a greater ability to listen to your inner voice, leading you towards a deep sense of inner peace, happiness, and fulfilment. Being a meditation teacher and psychotherapist is my calling. I have a gift for connecting authentically with my clients with an open and giving heart. My clients tell me that I listen to and empathise with them on a profound and deep level. I am sensitive and intuitive with a strong presence, which can help guide you towards healing and growth, even if you doubt that it is possible. I know what it is like to suffer greatly, and this helps me understand the depth of your pain and struggle. Because I have also found my way out of the pain, I can provide hope as you develop the courage you need to move towards more self-acceptance and confidence. I am passionate about learning and have a gained a lot of wisdom from my 8 years of intensive study with some of the best Western teachers offering teachings in Buddhist Dharma and meditation practice. Alongside my mindfulness teaching, I am training to teach Insight Meditation in the Buddhist tradition as a Community Dharma Leader. 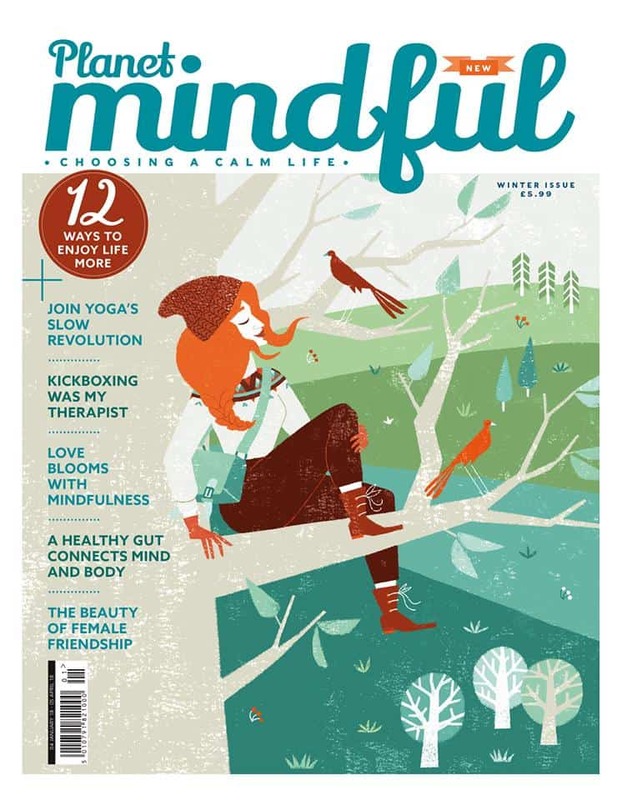 My article was featured in the first issue of planet mindful, a new quarterly magazine. • My Mindfulness Meditation Podcast has 5-star reviews in the UK and US iTunes store. Total downloads now exceed 175,000. • I was invited to have my guided meditations on the popular meditation app, Insight Timer. My guided meditations have over 6000 plays in the app. • I’ve been a guest on the Secular Buddhist Podcast, a popular podcast on Buddhist meditation. I lead mindfulness meditation classes regularly for Jamyang Buddhist Centre Leeds and Leeds City Council. I also mentor mindfulness teachers in training with the Mindfulness Training Institute. I meditate daily, usually for 30 minutes in the morning. I enjoy cooking and love preparing nourishing meals from scratch. I am in a loving and supportive relationship with a wonderful partner. I’ve (largely) tamed my (very harsh) inner critic and am happier, more grounded and more at comfortable in my skin than I’ve ever been. The thing is … I couldn’t have transformed all the toxic shame, self-doubt and chronic anxiety without help. My professional life is now all about giving that same kind of support and guidance to others. I want my clients to discover their personal power and beauty. I want them to trust their inner wisdom and know their worth so they can take their place in life, trust that they belong, and to live in alignment with their true self, just as I have begun doing. If it sounds like we might be a good match, please get in touch. I’m here to help you move through what’s holding you back (emotionally, psychologically or spiritually) so that you can connect to your authentic, genuine self and live a more engaging, fulfilling life. Or pencil in a time to talk using the call scheduler below. Calls are simply a chance to see if we might be a good match. Please contact me if you can't see a time that works for you.